Organic free-range eggs with a rich natural flavour. Our hens are reared with Soil Association approval for the highest welfare standard – they live in small, carefully tended flocks and spend most of the day outside. We don’t discriminate about size, so your box will contain a variety of fresh eggs for you to poach, fry or scramble. Soil Association-approved organic farms guarantee the best standard of welfare for laying hens; better even than free range. 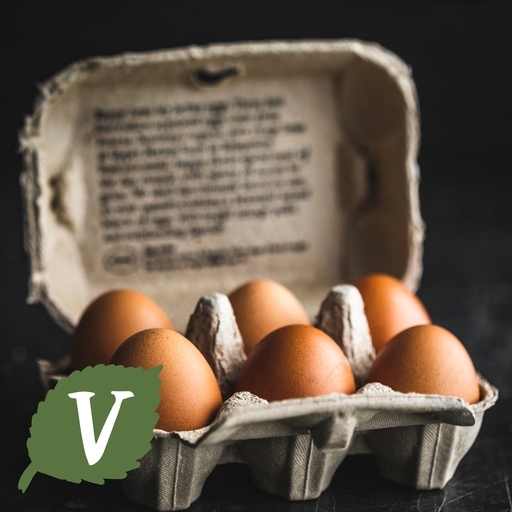 To learn more, visit our blog post on organic vs. free range eggs. This all adds up to a happier hen and eggs with a fantastic flavour. The Soil Association's organic standards are much higher than those set by the European Union and the Department of Environment, Food and Rural Affairs. The birds have a balanced, natural diet and from time to time some of our suppliers may feed their hens organic vitamins, derived from organic fruit only. It is believed that smaller flock sizes and access to fresh grass considerably lowers the risk of disease and infection in hens. Most of our suppliers will only ever use homeopathic remedies should a bird fall ill, but we're pleased to say their high levels of husbandry have meant they have never needed to use this form of treatment. The farmers who supply us with our mixed eggs have various flocks at different ages. The hens produce different sized eggs so rather than rejecting some sizes, we put mixed eggs into a punnet with a minimum total weight. Keep cool and eat as fresh as possible.